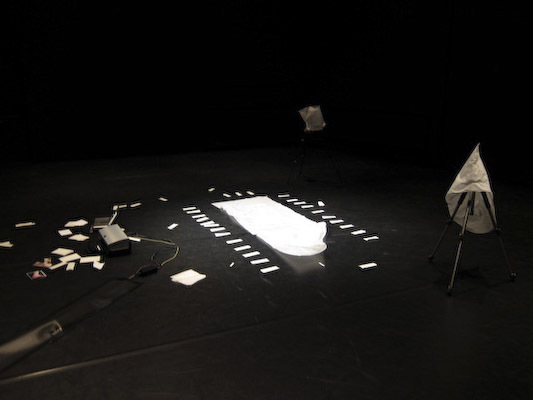 'Of Photography' uses the performer's body, live photographing, printing and choreographed movement to invite the audience to view - and take part in - a sensory, quietly disturbing take on spectatorship, seeing and 'visual identity'. The concept started as a reaction towards excessive photography of performances - or any event with some public 'photo-value' and asks what responsibility the photographer, or the consumer of images, may have towards their subject matter. 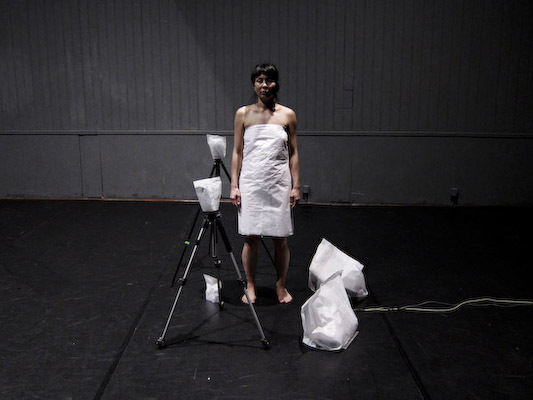 In 'Of Photography', the general acceptance of and participation in documenting or recording an event is turned into the performance itself - the audience are confronted to photograph the naked performer and then stick the instantaneously printed image back on her body - blurring the borders between artefact, maker, motif, observer and observed. Photos on this page are taken live as part of the piece by audience members. Realised with co-production from Plateaux Festival and support from The Basement, Brighton.